Astronaut Karen Nyberg poses wifth her and others' star-themed blocks at the International Quilt Festival in Houston, Oct. 30, 2014. A NASA astronaut, Nyberg wasn't in space looking out the windows onboard the International Space Station, nor was she outside looking up at the Houston night sky. In fact, at that moment, Nyberg was inside the George R. Brown Convention Center attending the International Quilt Festival, the largest annual quilt show in the world. But the stars she was seeing were not even the 2,200 star-themed quilt blocks she, herself, had inspired others to sew. Hundreds of amateur and professional quilters, out of the 60,000 or so attendees the show saw during its four days in Houston, lined up for an hour last Thursday (Oct. 30) to have their photo taken with Nyberg. Even more posed for shots with a cardboard cutout of the station crew member, which was positioned next a NASA exhibit booth. "It is really cool to see how excited everybody is," Nyberg said in a quick interview with collectSPACE as even more quilters came up to meet her. "That was kind of my goal, to get a group of people who maybe wouldn't have thought about space and get them excited." Nyberg, who almost a year ago returned to Earth after five months onboard the space station, was the first person to quilt in orbit. Her creation, a 9-inch square red, white and blue star, served as the inspiration for the Quilt Festival's "AstroBlock Challenge." More than 2,200 quilters from around the world submitted their own star-themed fabric blocks, which were then sewn together to create 28 quilt panels. The resulting galaxy of quilted stars — with Nyberg's made-in-space square front and center — premiered on display at the Quilt Festival. "With a project like this, what I think is really cool, is that you can take somebody from every part of this world and find something that you have in common with them. And we really do have something in common with people from everywhere," Nyberg told the festival attendees during a presentation about her experience quilting in space. "We received blocks from all over the world. There are quilters everywhere and there were people enthusiastic about this everywhere." As tremendous as an achievement as the quilt made from around the world, the one square Nyberg that crafted while circling the planet turned out to be a challenge itself. "It took me a long time for a number of reasons," Nyberg said, citing both a lack of advance planning for what she was going to make and her skills, or lack thereof, at hand-sewing as reasons. And then there was the mechanics of quilting in space. "I actually pried myself in my sleep station with my back against my sleeping bag and then my feet up [against the wall]," Nyberg described. "I had to have all of my supplies velcroed to the wall either on a velcro pad or inside ziplock bags to keep it all together." Karen Nyberg launched with a spool of ivory thread, five needles and three "fat quarters" of fabric. What she could not bring were scissors. "I had to use the scissors that were already there and they are not for cutting fabric," she stressed. "Cutting in space is the hardest thing. Imagine if you take a piece of fabric and hold it out in front of you [in the air]. Now, take your scissors and try to cut it and that is exactly what it is like. Because you can't lie it down on the floor, you can't use a rotary cutter, you just have to cut." "So that was another challenge," she stated. 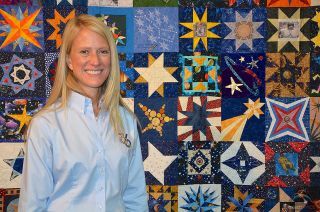 Karen Nyberg's sewn-in-space star square premiered on display at the International Quilt Festival in Houston. Ultimately though, Nyberg was happy with her quilted star, and even more so with the outcome of the entire project. The Quilt Festival now over, Nyberg said some museums have expressed interest in exhibiting the star-filled panels, and, in between those displays, the blocks will be going to the Texas Quilt Museum in La Grange. "I'm so happy the way this turned out because what I had in my mind, what I dreamed it turning into, it actually did," Nyberg said. "And, in fact, it is bigger than that." Click through to collectSPACE to watch a video of Karen Nyberg sewing her star in space.